We are in the 14th match of IPL 2019 and after this match, one team will remain winless. Fans of both teams will not want this to happen with their team. Rajasthan Royals is all set to take on Royal Challengers Bangalore on Tuesday, April 02, 2019 at Sawai Mansingh Stadium, Jaipur. If you are looking for players injury updates, RCB vs RR latest team news, Rajasthan Royals and Royal Challengers Bangalore full squad, Dream11 FREE teams for a grand league, teams for fantasy cricket leagues then you are at the right place. We have covered all the above information in this post. You just need to read the complete post if you want to increase your chance of winning by 100%. All the information, details and statistics are almost 100% accurate and taken from very reliable sources so make sure to read it carefully. 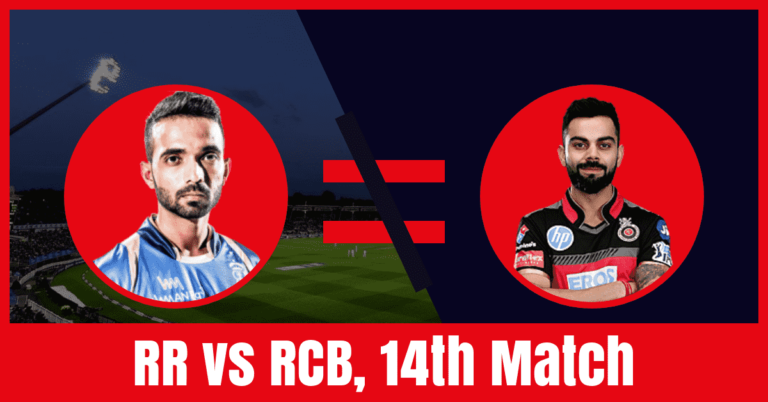 We have also included astrology prediction of RR vs RCB so you don’t have to go anywhere else to find any details. Our funda is very simple, we predict, the players perform and you win. Rajasthan Royals have played 3 matches and have lost all the three matches. They are in the 2nd last position of the points table with zero points in their pocket. They have lost their 1st match against KXIP by 14 runs, 2nd match against SRH by 5 wickets and 3rd match against CSK by eight runs. Sanju Samson, Ajinkya Rahane, Jos Buttler and Ben Stokes are the top scorers of Rajasthan team. They have scored 140, 97, 80 and 68 runs. Ben Stokes, Shreyas Gopal and Jofra Archer are the top wicket-takers of RR team. On the other hand, Royal Challengers Bangalore also played 3 games and have lost all the three games. They are in the last position of the points table in the 12th season of IPL because of Net Run Rate. They have lost two matches with a big difference. They have lost their first match against CSK by 7 wickets, the second match against MI by six runs and the third match against SRH by 118 runs. AB de Villiers, Parthiv Patel, Virat Kohli and Colin de Grandhomme are the top scorers of Bangalore team. They have scored 80, 71, 55 and 43 runs. Yuzvendra Chahal, Mohammed Siraj and Umesh Yadav are the top wicket-takers of RCB. They have taken 6, 3 and 2 wickets. Ajinkya Rahane, Jos Buttler, Sanju Samson, Ben Stokes, Steven Smith/Ashton Turner and Jofra Archer are the key players of Rajasthan Royals Team. Ajinkya Rahane will lead the RR team. Ashton Turner is available for selection and he may replace Steven Smith in the playing 11. Ajinkya Rahane, Jos Buttler and Sanju Samson will lead the batting department. Dhawal Kulkarni, Jofra Archer and Jaydev Unadkat will lead the bowling department. Ben Stokes and Krishnappa Gowtham will play as a key all-rounder. Jos Buttler and Ben Stokes are the most valuable players of RR team. Batsmen: Sanju Samson, Ajinkya Rahane, Rahul Tripathi, Steven Smith/Aston Turner. All-Rounders: Ben Stokes, K Gowtham. Bowlers: Jofra Archer, Shreyas Gopal, Jaydev Unadkat, Varun Aaron/Dhawal Kulkarni. Ajinkya Rahane(c), Rahul Tripathi, Varun Aaron, Jos Buttler(w), Shubham Ranjane, Sanju Samson, Aryaman Birla, Manan Vohra, Steven Smith, Stuart Binny, Ben Stokes, Shashank Singh, Krishnappa Gowtham, Riyan Parag, Jofra Archer, Ish Sodhi, Shreyas Gopal, Dhawal Kulkarni, Jaydev Unadkat, Liam Livingstone, Prashant Chopra, Oshane Thomas, Ashton Turner, Sudhesan Midhun, Mahipal Lomror. Virat Kohli, AB de Villiers, Colin de Grandhomme, Yuzvendra Chahal, Marcus Stoinis and Nathan Coulter-Nile are the key players of Royal Challengers Bangalore Team. Marcus Stoinis and Nathan Coulter-Nile are available for selection and they may replace Moeen Ali and Shimron Hetmyer respectively. Washington Sundar may get a chance to play if the pitch favours the spinners. Yuzvendra Chahal, Umesh Yadav and Nathan Coulter-Nile will lead the bowling department. Colin de Grandhomme and Marcus Stoinis will play as a key all-rounder. Virat Kohli, AB de Villiers and Marcus Stoinis are the most valuable players of Bangalore team. Bowlers: Nathan Coulter-Nile, Umesh Yadav, Yuzvendra Chahal, Mohammad Siraj, Prayas Ray Burman. Virat Kohli(c), Parthiv Patel(w), Heinrich Klaasen, Shimron Hetmyer, Milind Kumar, AB de Villiers, Nathan Coulter-Nile, Gurkeerat Singh Mann, Moeen Ali, Navdeep Saini, Shivam Dube, Devdutt Padikkal, Marcus Stoinis, Colin de Grandhomme, Tim Southee, Prayas Barman, Kulwant Khejroliya, Umesh Yadav, Pawan Negi, Mohammed Siraj, Washington Sundar, Yuzvendra Chahal, Akshdeep Nath, Himmat Singh. The pitch of Sawai Mansingh Stadium, Jaipur will be good for batting and a high score is expected today. The ball will come nicely into the bat and the batsmen can trust the bounce and can play their shots. The spin bowlers can also take advantage of the wicket because of the big boundaries. Dream11 Fantasy Cricket Tips: Try to take top-order batsmen and sip bowlers in your teams. A hot and humid day is predicted today. The weather of Jaipur is forecasted to be sunny and it will remain the same throughout the day. The sky will be clear and there is no chance of rain today. Dew can come into the play in the latter half of the match. The temperature is expected to be 32-Degree Celsius and the humidity to 12%. Dream11 Fantasy Cricket Tips: The weather condition may favour the batsmen and the spin bowlers. According to Crix11 Astrology Cricket match prediction RCB will win the match today. RR will win the toss and opt to bat first. This is it for Today’s RR vs RCB Dream11 Fantasy Cricket Prediction 14th Match. What is your best team? What do you think Who Will Win Today? Leave a reply in the comment section.